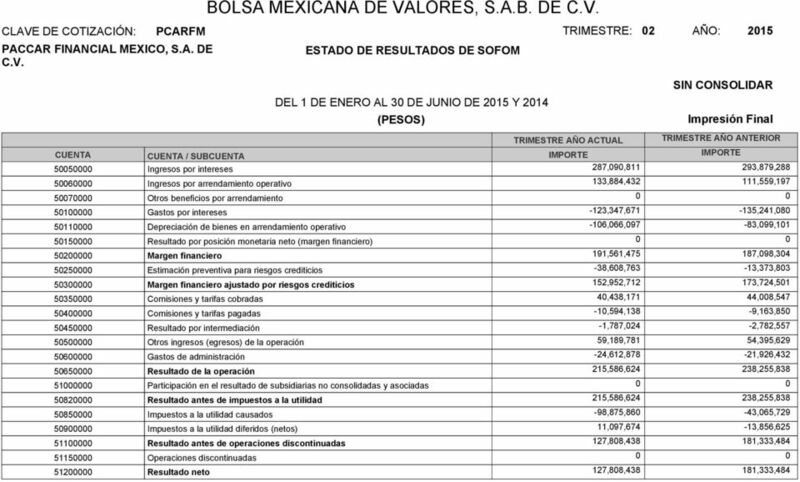 7 COMENTARIOS Y ANALISIS DE LA C.V. ADMINISTRACIÓN SOBRE LOS RESULTADOS PAGINA 1 / 5 DE OPERACIÓN Y SITUACIÓN FINANCIERA DE LA COMPAÑÍA BOLSA MEXICANA DE VALORES, S.A. DE C.V. CLAVE DE COTIZACION: C.V. TRIMESTRE: 1 AÑO: 2015 COMENTARIOS Y ANALISIS DE LA ADMINISTRACION SOBRE LOS RESULTADOS DE OPERACIÓN Y SITUACION FINANCIERA DE LA COMPAÑÍA ANEXO 1 JULIO 28, RESULTADOS DE LA OPERACIÓN: INFORMACION FINANCIERA DE LA COMPAÑÍA CORRESPONDIENTE AL 30 DE JUNIO DE 2015 Y 2014: INGRESOS LOS INGRESOS TOTALES POR INTERESES DERIVADOS DE ARRENDAMIENTO FINANCIERO Y CREDITO REFACCIONARIO, ASI COMO POR RENTAS DERIVADO DE ARRENDAMIENTO OPERATIVO DURANTE EL PERIODO DE SEIS MESES TERMINADO AL 30 DE JUNIO DE 2015 ASCENDIERON A $420,975,243 PRESENTANDO UN AUMENTO DEL 3.83% CON RELACION A LOS $405,438,485 DURANTE EL MISMO PERIODO DE DICHA VARIACION SE DEBIO PRINCIPALMENTE AL INCREMENTO EN INGRESOS POR ARRENDAMIENTO OPERATIVO DURANTE 2015, LOS CUALES SE INCREMENTARON DE $111,559,197 AL 30 DE JUNIO DE 2014, A $133,884,432 AL 30 DE JUNIO DE GASTOS LOS GASTOS INCLUYEN LOS INTERESES INCURRIDOS POR LA COMPAÑÍA, LOS CUALES DURANTE EL PERIODO DE SEIS MESES TERMINADO AL 30 DE JUNIO DE 2015 ASCENDIERON A $123,347,671 Y DISMINUYERON 8.79% CON RELACION A LOS $135,241,080 CORRESPONDIENTES AL MISMO PERIODO DE 2014, ESTE DECREMENTO SE DEBIO PRINCIPALMENTE A LA BAJA EN LOS GASTOS POR INTERESES CON NAFIN. 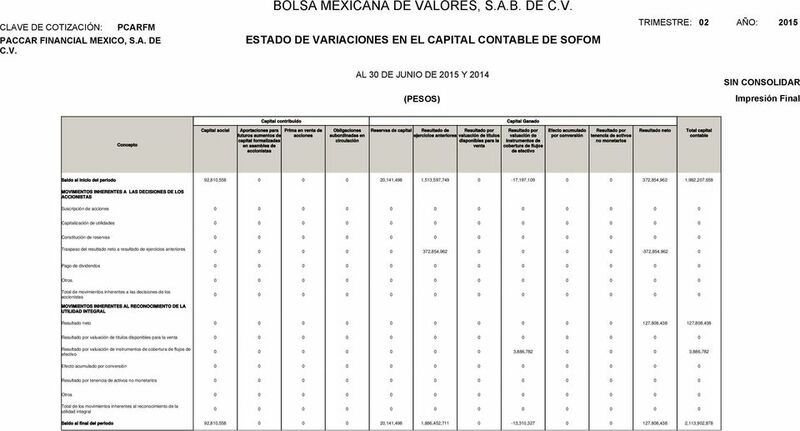 MARGEN FINANCIERO EL MARGEN FINANCIERO POR EL PERIODO DE SEIS MESES TERMINADO AL 30 DE JUNIO DE 2015 DE $191,561,475 A JUNIO 2015 FUE COMPARABLE CON EL DE $187,098,304 AL 30 DE JUNIO DE ESTIMACION PREVENTIVA PARA RIESGOS CREDITICIOS POR EL PERIODO DE SEIS MESES TERMINADO AL 30 DE JUNIO DE 2015 Y 2014, FUE UN GASTO POR $38,608,763 Y DE $13,373,803, RESPECTIVAMENTE. 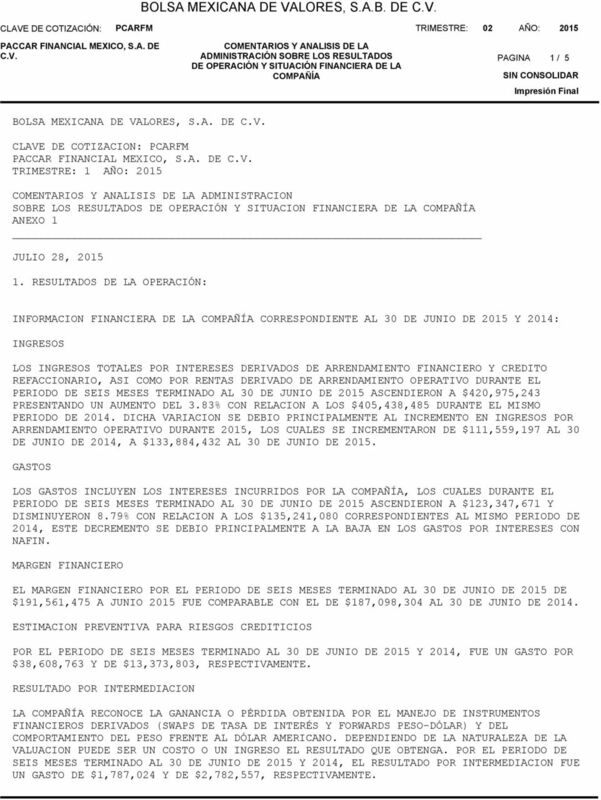 RESULTADO POR INTERMEDIACION LA COMPAÑÍA RECONOCE LA GANANCIA O PÉRDIDA OBTENIDA POR EL MANEJO DE INSTRUMENTOS FINANCIEROS DERIVADOS (SWAPS DE TASA DE INTERÉS Y FORWARDS PESO-DÓLAR) Y DEL COMPORTAMIENTO DEL PESO FRENTE AL DÓLAR AMERICANO. 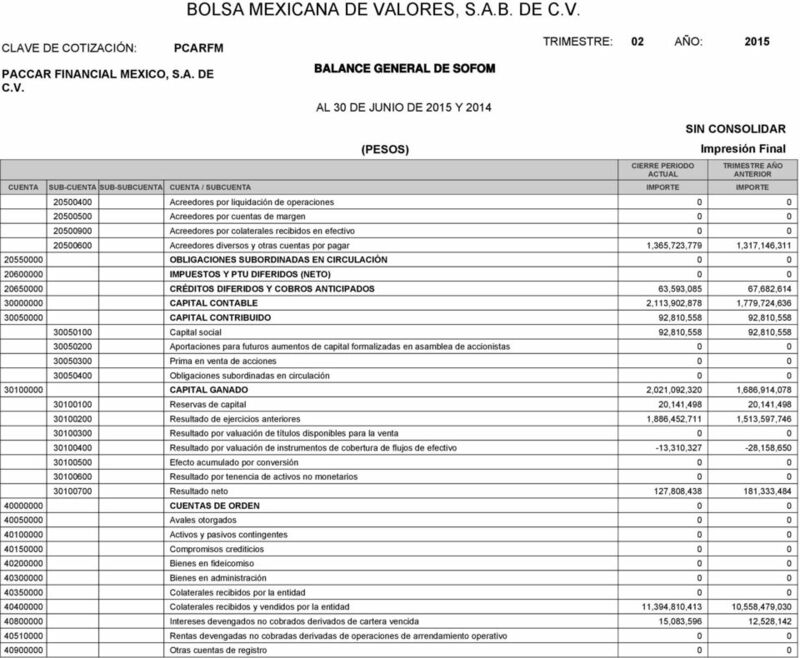 DEPENDIENDO DE LA NATURALEZA DE LA VALUACION PUEDE SER UN COSTO O UN INGRESO EL RESULTADO QUE OBTENGA. 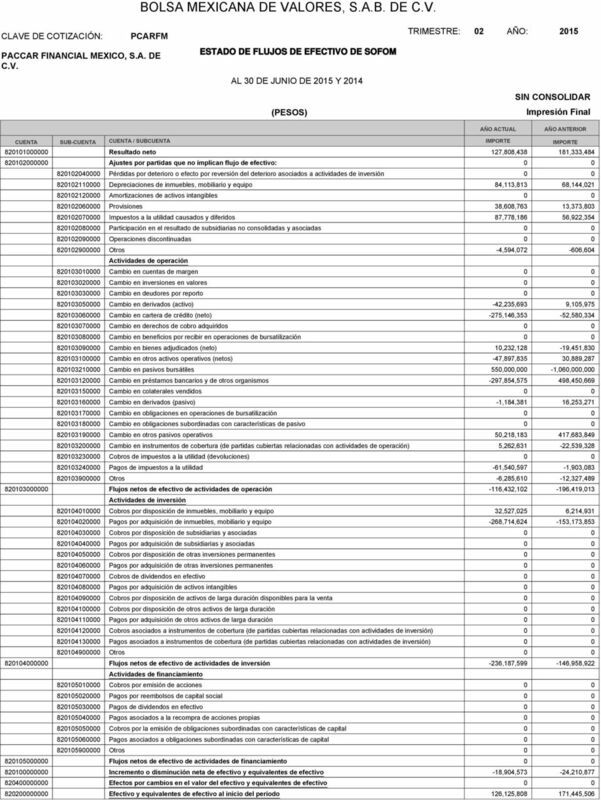 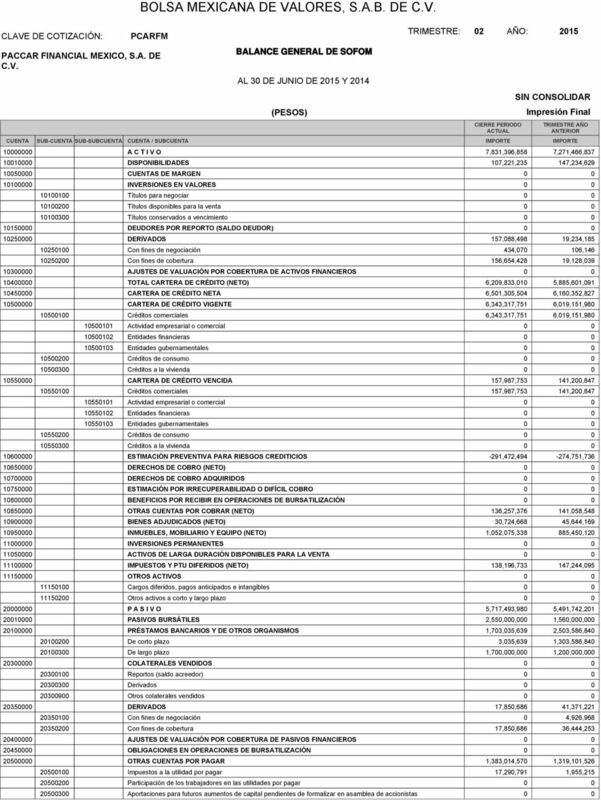 POR EL PERIODO DE SEIS MESES TERMINADO AL 30 DE JUNIO DE 2015 Y 2014, EL RESULTADO POR INTERMEDIACION FUE UN GASTO DE $1,787,024 Y DE $2,782,557, RESPECTIVAMENTE. 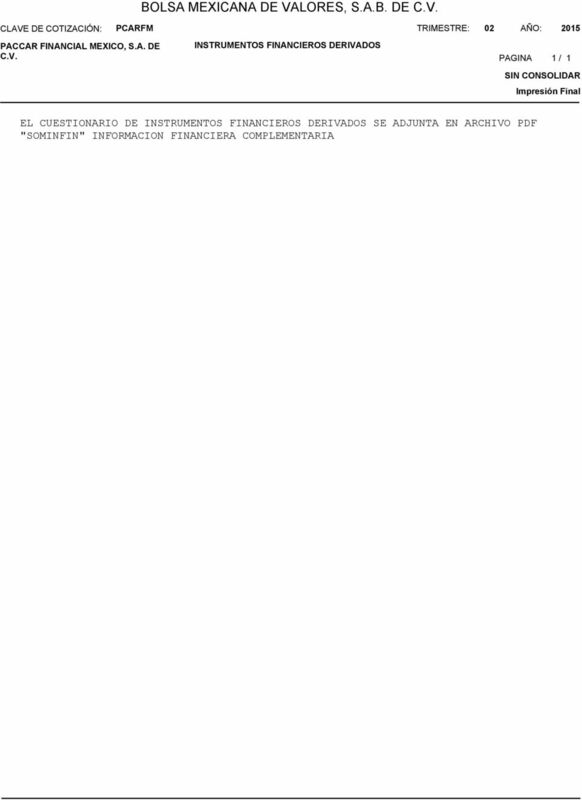 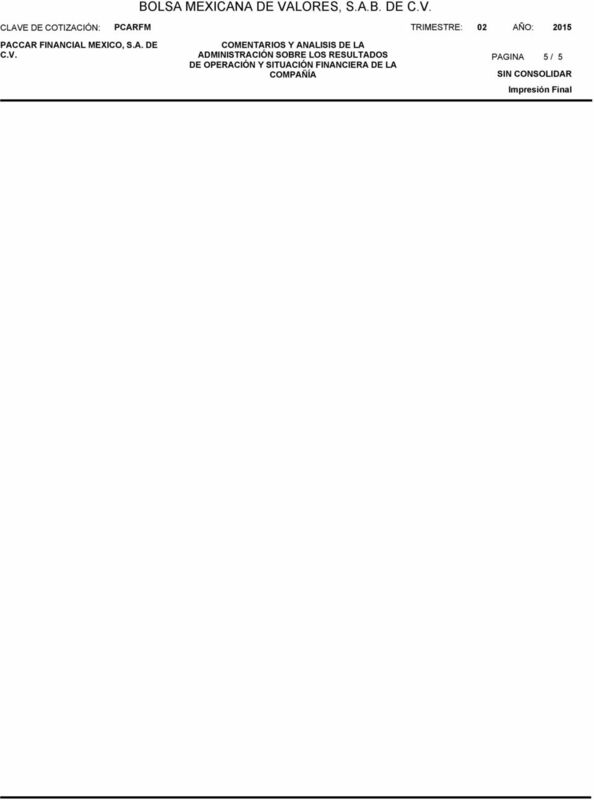 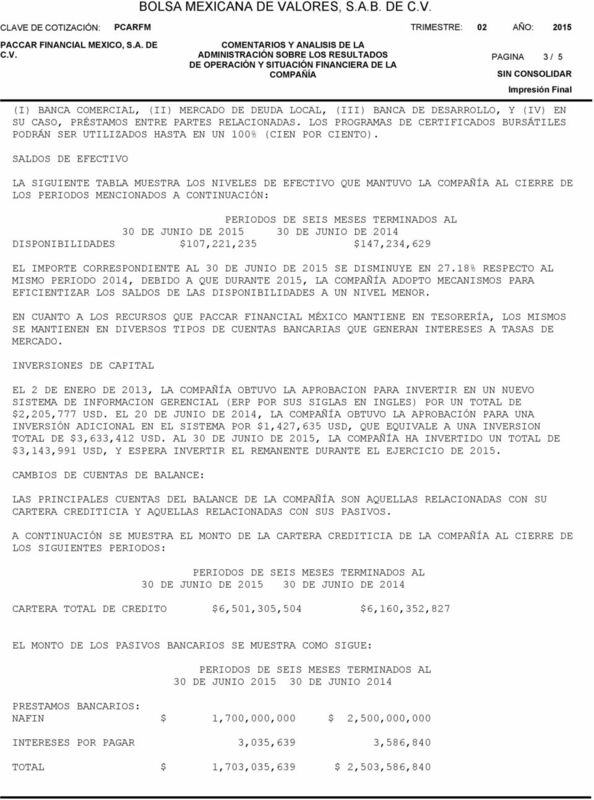 12 PACCAR FINANCIAL MEXICO, S.A. DE C.V. NOTAS COMPLEMENTARIAS A LA INFORMACIÓN FINANCIERA PAGINA 1 / 1 LAS NOTAS A LOS ESTADOS FINANCIEROS SE ADJUNTAN EN ARCHIVO PDF "SOMINFIN" INFORMACION FINANCIERA COMPLEMENTARIA.